Have you started thinking about that perfect summer bag to take on vacation? 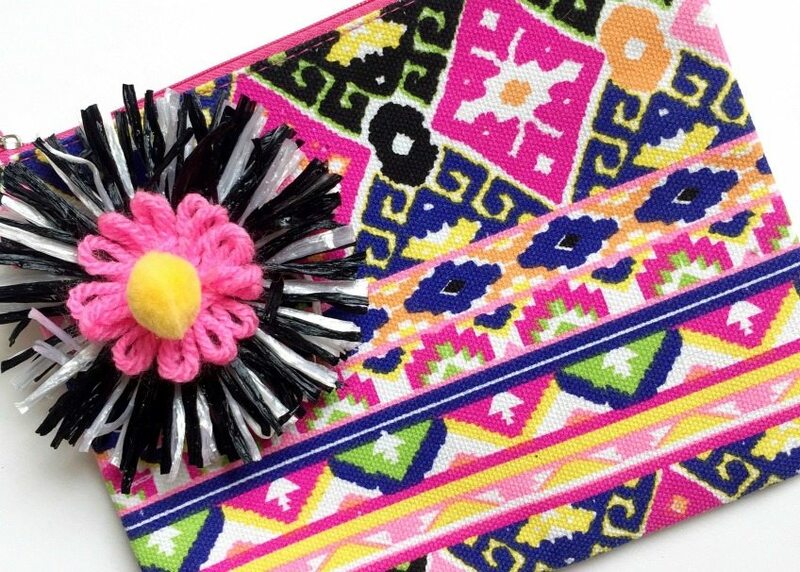 Ya know the colorful clutch that will match your swim suit cover-up? 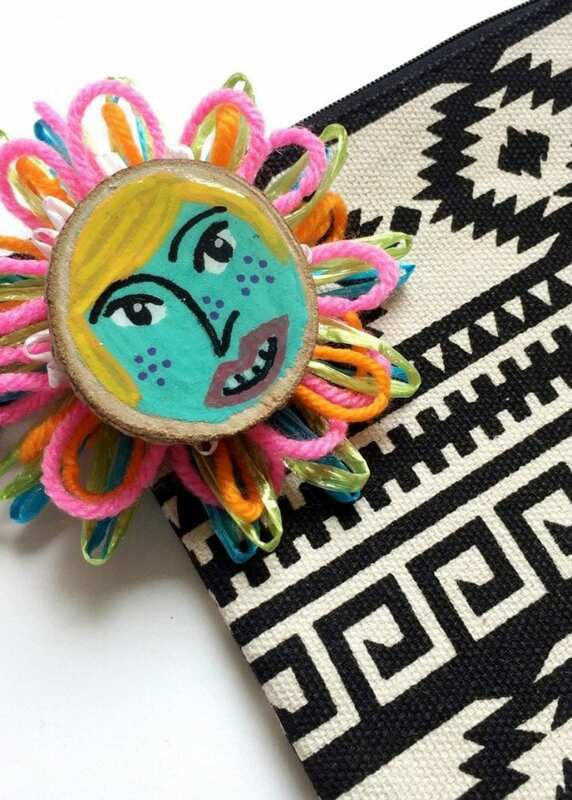 Be the bell of the beach ball when you upgrade your ready made bags with easy-peasy flower loom embellishments. 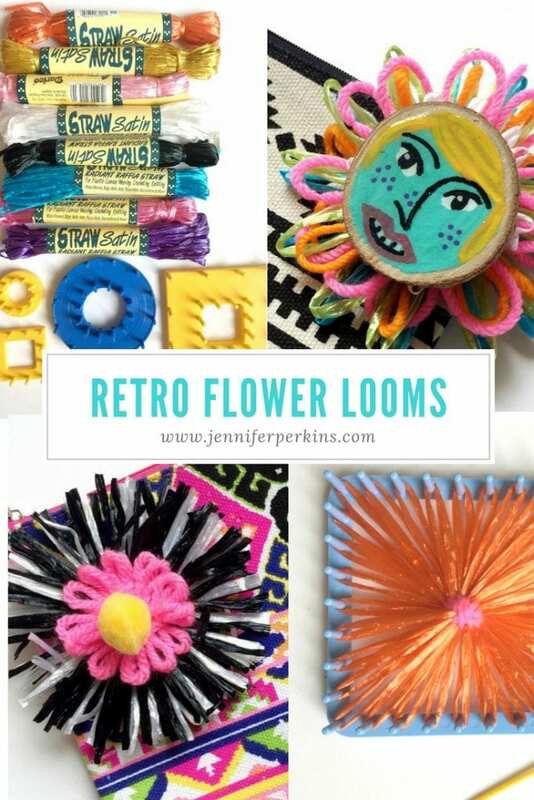 Using yarn or kitschy vintage plastic straw raffia – either way loomed flowers are the perfect summer wardrobe addition. I’m a fan of more is more and mixy-matchy – big shock I know. That being said the flowers that use vintage plastic raffia in combination with yarn loom flowers are my favorite. This one even got a pompom, because ya know, say it with me: everything is better with pompoms. Ok, how do you make these amazing flowers? Read on! Oh and heads up – Amazon affiliate links coming. Anything you purchase through these links helps support this blog. A few notes about the supplies. I have a Clover Hana-Ami flower loom which I am demonstrating here as well as several vintage flower looms. Check out my Vintage Craft Chat with Cathy Callahan of California to see where my love of vintage loomed flowers came from. Both types of looms will work. Also, you can use yarn or raffia. 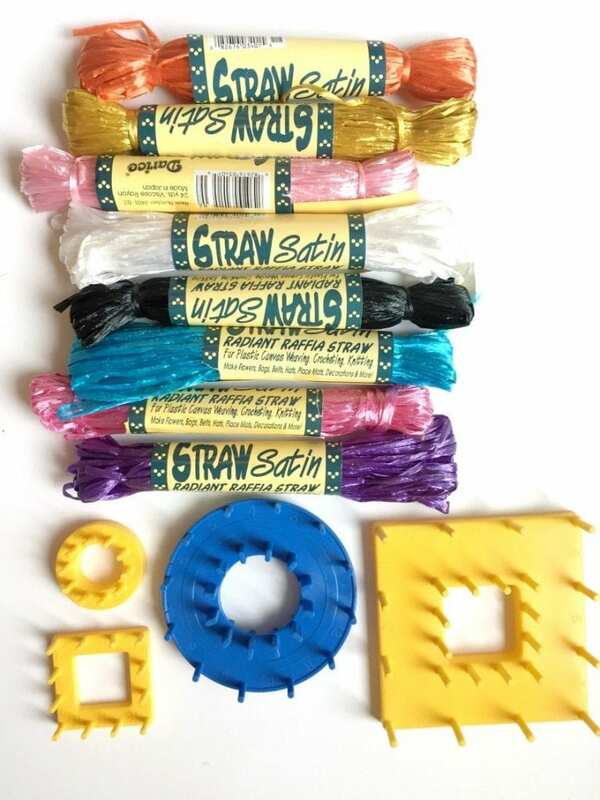 Straw farris is available in most craft stores and if you look really hard on places like eBay and Etsy you can find the vintage plastic straw raffia. 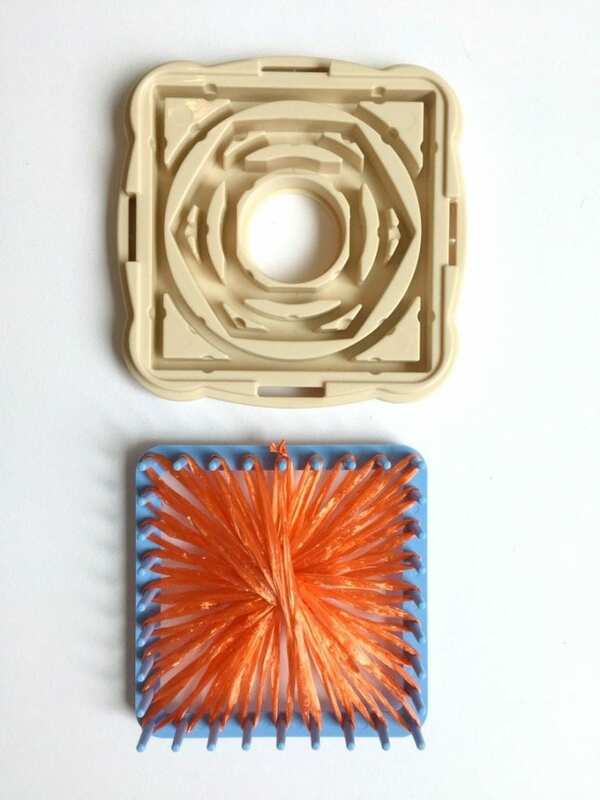 The Clover Hana-Ami Flower loom comes with six shapes. 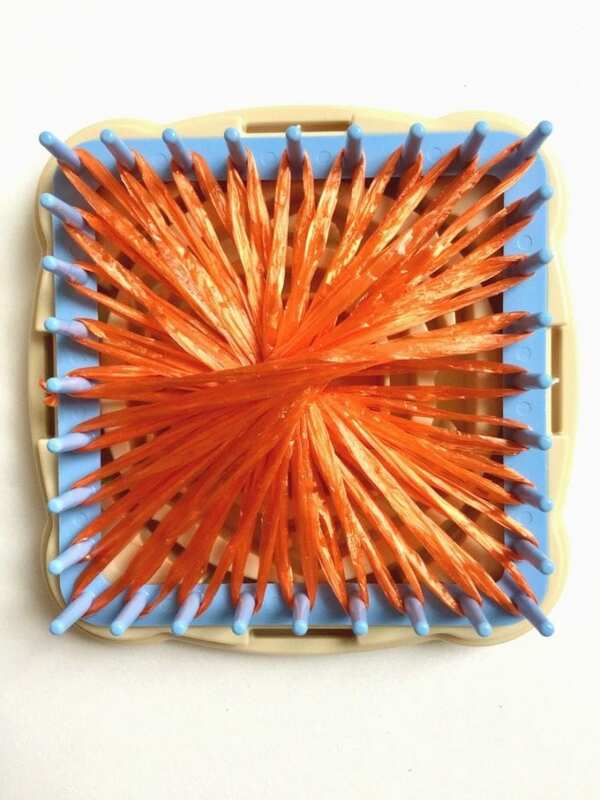 There is a tan colored base and you click the size flower loom you want in and begin to loop your yarn, raffia or plastic straw around the prongs. You start at one prong and loop directly across, go back up to where you started and go around the peg directly next to it. If you prefer a video tutorial check out this episode of DIY This With Jennifer Perkins where you can watch step by step. 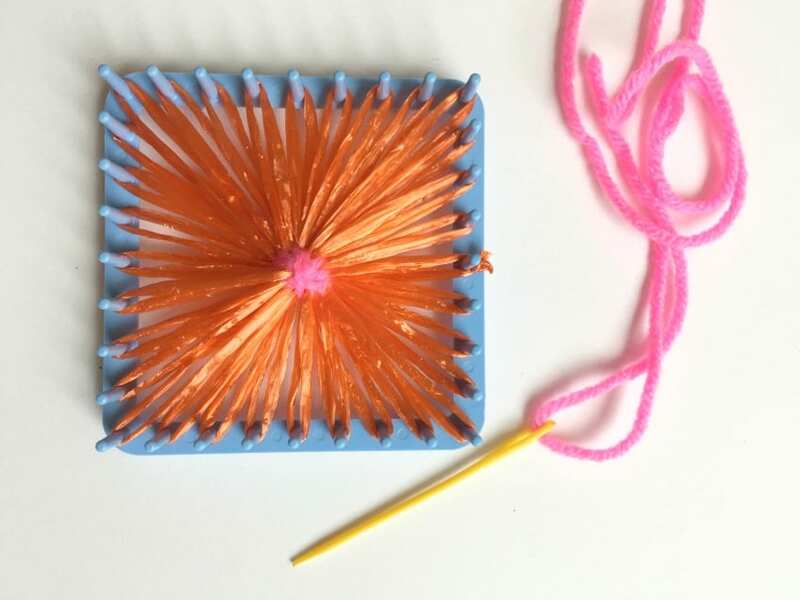 You can can also check out How to Make a Purse Out of a Placemat and Retro Loom Flowers over on the DIY Network for even more visuals and instructions. Once you have all the loops on the pegs remove the top part of the loom from the base. You can also get a better idea from this picture of how the 6 different loom options fit into the base. The vintage flower looms are variations on the purple part without the base. Using yarn or thread stitch the center together. This will keep the flower from coming apart. Do this BEFORE removing the flower from the loom. From here it is totally up to you what you will embellish with these awesome flowers! Might I suggest getting crazy and adding something fun like a small painted disc. I got Artsy and Craftsy using a piece of Jennifer Perkins Art in the center. Attach loomed flowers to readymade purses using hot glue. Super cute right! Now I want to cover an entire beach bag with them! Did I mention how cute the look on a yellow Christmas tree? Want more ideas? Keep reading! Can you Wear Paper? 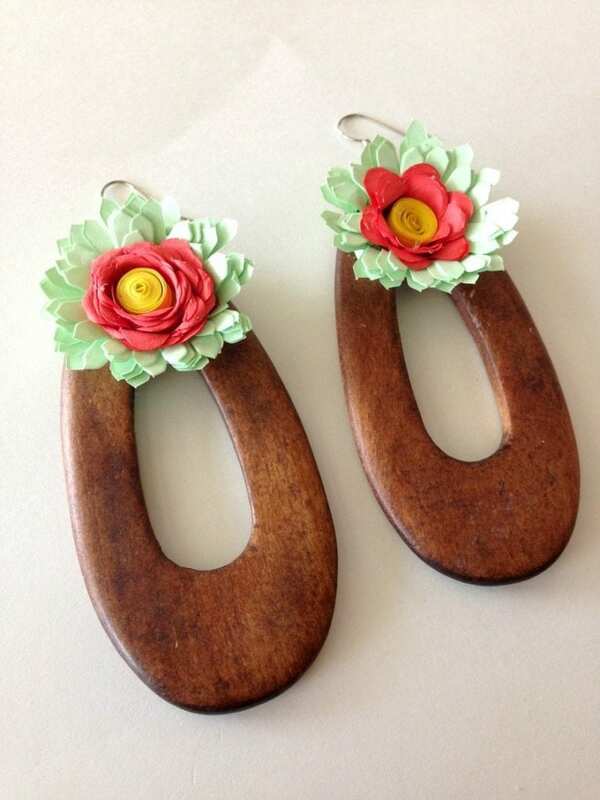 Yes, Make These DIY Quilled Flower Earrings – Ever wanted to know more about paper quilling? Ya me too. 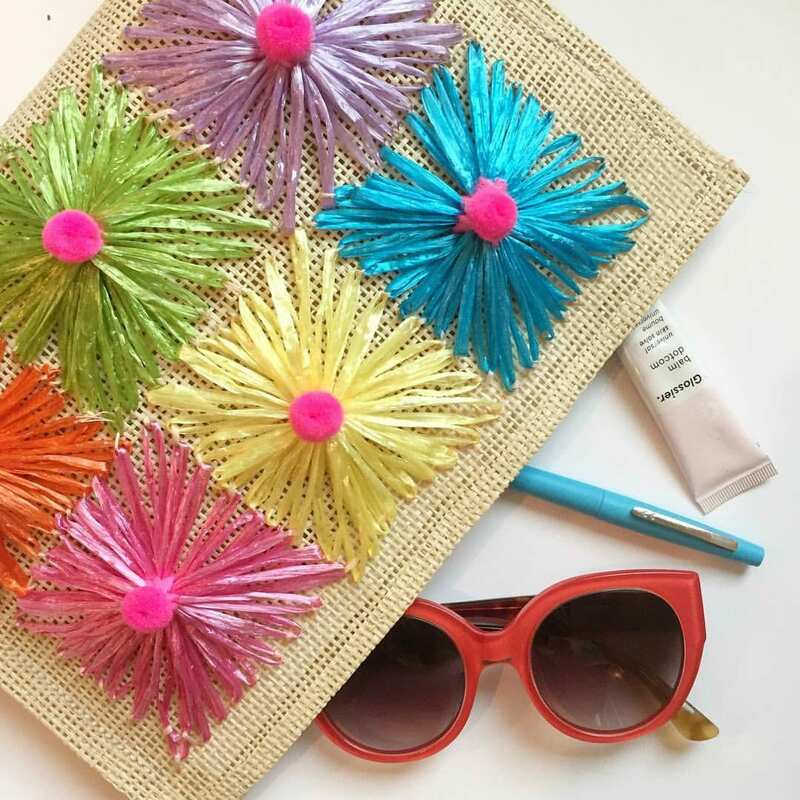 5 Easy and Adorable Placemat Purses – Including the one I made for DIY Network using a whole slew of plastic raffia loomed flowers! 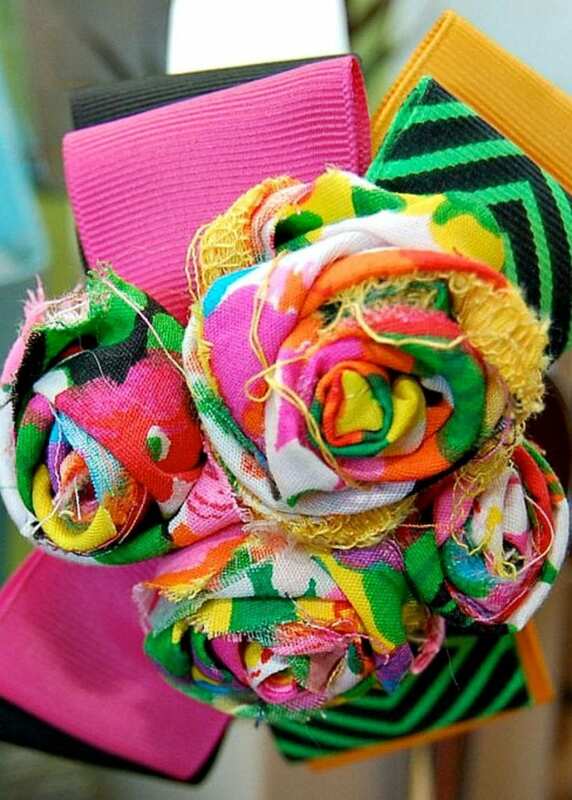 Craft a Bouquet of Colorful Scrap Fabric Rolled Flowers – If you are like me and most other craft supply hoarders you can’t say goodbye to your favorite colorful fabric scraps. Now you don’t have to with these flowers! Posted May 29, 2018 & filed under Crafts, Uncategorized, Wearable Crafts. I remember my flower loom, what fun it was! I love how you’ve made embellishments that are retro but still up to date. Thank you, so glad you like it. You should bust it out or get a new one! As you can see from the picture I have several.